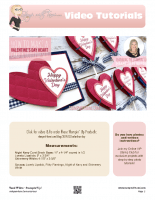 Welcome to my Stamp It Demonstrator’s Group Valentine’s Day Blog Hop. We’re all really excited to unveil our projects, and announce a new contest give-away (below). To continue on your journey through our projects, simply use the BLOG HOPPERS links below. This online DIY class video will be creating these fun and easy Valentine’s day sets. A coordinating card and lollipop set made with the Stampin’ Up! Meant to Be Bundle. I’ll show you how to create these cute fold over heart shaped lollipop covers to match the card. Live winners: I will have live prize patrol for those able to catch the live taping of this video. The winners will be drawn live on the video. Awesome sweet treat holders..I forgot to mention #stampitcontest. It’s not letting me comment. Is there something specific you did to comment besides the regular way? Lol sorry!! I got scared for a minute!!! #stampitcontest love your project, I will be making some.